the power to hold, retain, or contain, or the ability to absorb; usually expressed numerically as the measure of such ability. closing capacity (CC) the volume of gas in the lungs at the time of airway closure, the sum of the closing volume and the residual volume. See also closing volume. decreased intracranial adaptive capacity a nursing diagnosis accepted by the North American Nursing Diagnosis Association, defined as the state in which intracranial fluid dynamic mechanisms that normally compensate for increases in intracranial volumes are compromised, resulting in repeated disproportionate increases in intracranial pressure in response to a variety of noxious and nonnoxious stimuli. diffusing capacity see diffusing capacity. forced vital capacity the maximal volume of gas that can be exhaled from full inhalation by exhaling as forcefully and rapidly as possible. See also pulmonary function tests. functional residual capacity the amount of gas remaining at the end of normal quiet respiration. heat capacity the amount of heat required to raise the temperature of a specific quantity of a substance by one degree Celsius. inspiratory capacity the volume of gas that can be taken into the lungs in a full inhalation, starting from the resting inspiratory position; equal to the tidal volume plus the inspiratory reserve volume. maximal breathing capacity maximum voluntary ventilation. total lung capacity the amount of gas contained in the lung at the end of a maximal inhalation. Subdivisions of total lung capacity: TLC, total lung capacity; V, tidal volume; IC, inspiratory capacity; FRC, functional residual capacity; ERV, expiratory reserve volume; VC, vital capacity; RV, residual volume. From Dorland's, 2000.
virus neutralizing capacity the ability of a serum to inhibit the infectivity of a virus. vital capacity (VC) see vital capacity. the quantity of heat required to raise the temperature of a system 1°C. 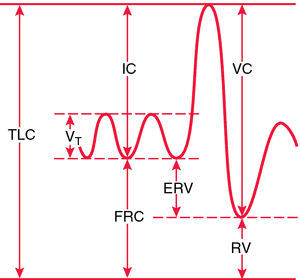 the volume of gas in the lungs at the time of airway closure. See also closing volume. the maximal volume of gas that can be exhaled from full inspiration exhaling as forcefully and rapidly as possible. See also pulmonary function tests. the amount of gas remaining at the end of normal quiet respiration. the volume of gas that can be taken into the lungs in a full inspiration, starting from the resting inspiratory position; equal to the tidal volume plus the inspiratory reserve volume. the amount of heat absorbed by a body in being raised 1°C. the amount of gas contained in the lung at the end of a maximal inspiration. the ability of a serum to inhibit the infectivity of a virus. the volume of gas that can be expelled from the lungs from a position of full inspiration, with no limit to duration of expiration; equal to inspiratory capacity plus expiratory reserve volume. The specific thermal capacity of both the uncompatibilized and compatibilized blends was evaluated by the photothermic technique in order to verify the influence of the compatibilizer agent in this thermal property. 2] * --for the calculation of active thermal capacity of internal surface area of the heated premises, the area of the furniture surface is established according to STR 2. The system (reactor) thermal capacity must be determined, but only once. WAPDA's combined hydel and thermal capacity is 11,272 MW. Further, it has been decided that in the 13th plan coal- based thermal capacity addition will be attained through supercritical units only. Sizes RA26 through RA90 have high thermal capacity die-cast aluminum housings, designed for exceptionally efficient heat dissipation, resulting in maximum torque output in a highly compact package. This of course will not be constantly available and requires backup thermal capacity reducing its efficacy in saving fossil fuel carbon emission. Additional features include a high thermal capacity, low density and light weight. Planned for construction at FPL's existing Martin Plant site, the Martin project will provide up to 75 megawatts of solar thermal capacity in an innovative "hybrid" design that will connect to an existing combined-cycle power plant. Obviously, in these models, the thermal capacity of the mass of the aggregate fluid in the building and the GHX loops play no role. A simultaneous upgrade of the cooling tower will increase its thermal capacity, which is crucial to the production of propylene and ethylene.